A popular green tea. Light, golden yellow liquor with a unique, toasty rice flavor tending toward sweet. A tea that creates conversation. Cup Characteristics: Light, golden yellow liquor with a unique, toasty rice flavor tending sweet. A tea that creates conversation. Infusion: Tending bright with toasted rice kernels. 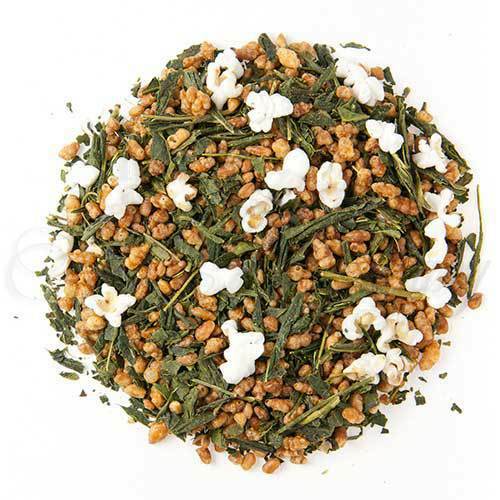 Luxury Ingredients: Green tea, and Roasted & Popped Rice. Traditional method (see note below): When preparing by the cup, this tea can be used repeatedly – about 3 times. The secret is to use water that is about 180°F/82°C. Place 1 slightly heaping teaspoon in your cup let the tea steep for about 3 minutes and then begin enjoying a cup of enchantment – do not remove the leaves from the cup. Adding milk and sugar is not recommended. Once the water level is low – add more water, and so on and so on – until the flavor of the tea is exhausted. Look at the pattern of the leaves in the brew, not only do they foretell your fortune but you can see the bud and shoots presenting themselves, looking like they are about to be plucked. Modern Method: Bring filtered or freshly drawn cold water to a rolling boil. Place 1 slightly heaping teaspoon of loose tea, 1 tea bag or 1 Q3 portion control pack for each 7-9oz/200-260ml of fluid volume in the teapot. Pour the boiling water into the teapot. Cover and let steep for 3-7 minutes according to taste (the longer the steeping time the stronger the tea). Adding milk or sugar is not recommended. Ideal Brewing Temperature: 100ºC/212ºF. Minimum Brewing Temperature: 90ºC/194ºF.